If you would like to experience a Reiki Treatment I give treatments in my therapy rooms in Matlock. If you would like a treatment please contact me my phone (01629 733227) and we can arrange a time suitable to you. I am always amazed by the magic of the human body and because the body is so amazing it has been created with an all healing part, in which case why can't heal ourselves? In order to heal ourselves we have to reach a place of deep relaxation. The best way to achieve this very relaxed state is to experience a therapy like Reiki, Reflexoloty, E.F.T and other holistic therapies of which there are many. I have been a holistic practitioner and Reiki teacher and healer for 15 years and I feel that there will be at least one therapy that I offer that will suit most people. I offer the following treatments and therapies in my therapy rooms in Snitterton Road Matlock. REIKI HEALING (Usui / Tibetan) is a form of HEALING using UNIVERSAL LIFE FORCE ENERGY which works on the emotional, mental, physical and spiritual levels of our being to promote total and complete healing for our highest good. It is safe for anyone whether young, old, pregnant, healthy, sick or terminally ill. The client remains fully clothed throughout the healing and the REIKI flows through the hands of the practitioner who is used as a channel for the energy. COLOUR REIKI HEALING is a powerful form of healing which has evolved from the merging of two dynamic therapies - Colour healing and Reiki. Colour healing has been used since the earliest of times in the healing temples of Ancient Egypt , China and the Lost continent of Atlantis. When you combine this with Reiki you have a healing therapy which works on the emotional, mental, physical and spiritual levels of our being and combines Universal Life Force energy with the wisdom and advanced healing technologies of the Ancients. KARUNA REIKI® TREATMENTS bring in healing energies that are noticeably stronger and able to more quickly heal a wider range of difficulties. Karuna Reiki energy goes deep very quickly and can therefore facilitate deep healing. Karuna Reiki envelopes us in a ball of compassionate energy and brings about deep soul healing and can heal such issues as child abuse, heals the shadow self, co-dependant issues, heals addictions, heals fear and panic and can bring peace and create trust in life. INTUITIVE COUNSELLING & PSYCHIC HEALING I come from a long line of intuitives - mother, grandmother and my own daughter. With this treatment I combine my counseling skills with my intuition and psychic healing. This session will help you explore who you truly are giving practical advice and will help you to understand and explore your soul. It will help you to participate in your own healing. The client can be guided to help resolve issues in just a few sessions and can help them emerge from negative patterns stronger and wiser. This session is for one and a half hours and will cost £45. REFLEXOLOGY TREATMENTS This is an ancient form of healing, first practiced in India, China and Egypt . The science of Reflexology embraces the idea that there are reflex points on the feet and hands which correspond to different organs, glands and parts of the body. You don't have to be ill to appreciate the effects of a reflexology treatment. It's a very good way of making time and pampering yourself. MATERNITY REFLEXOLOGY TREATMENTS This is a specialised branch of Reflexology and Janet has been highly trained in this field. It is aimed specifically at women during pre-conception, pregnancy, labour and the post natal period. E. F. T. (Emotional Freedom Technique) Treatment is a revolutionary and totally unique form of meridian therapy. E.F.T. is best described as a natural drug-free, non-invasive system to eliminate the root cause of negative emotions. HOPI EAR CANDLING or Thermal Auricular Therapy is a pleasant and non-invasive treatment of the ears, used to treat a variety of conditions of the ears and sinuses and it has a relaxing and claming effect on stress related disorders. This is an ancient and natural therapy handed down by many civilisations including the Hopi Indians of North America . Ear candles were used traditionally by shamen and healers. The candles are still made today on the basis of the old traditional formula originating from the Hopi Indians. MEDITATION Many therapists are now recommending learning to meditate as part of therapy. The benefits of meditation have a snowball effect starting with reducing your stress. Meditation brings the body and mind to a state of peace and balance, which will in turn reduce stress, allowing the body to heal and improve and maintain health. 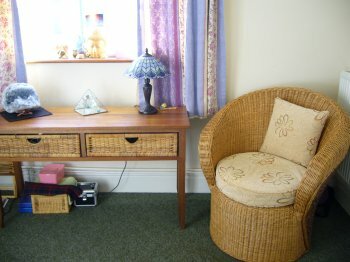 I can offer a one hour lead meditation session at my therapy rooms to help you relax, de-stress and feel rejuvenated. All treatments are carried out in Matlock and take around one hour they are all priced at £30 excluding Intuitive Counselling & Psychic Healing. For more information or to book an appointment please phone 01629 733227 or e.mail me.